Jennifer Stehlar: WENT TO PROM! Deanna Russo of Crusade Against Impaired Driving and I, ventured out to the Iroquois Senior Prom @ the Hyatt Regency in downtown Buffalo. 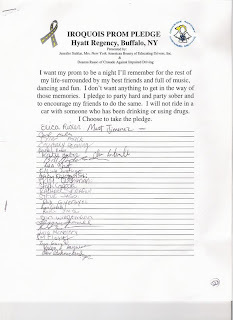 We had prom pledges in reminder to be safe and sober behind the wheel. The students were extremely receptive to the promise and signed on. It was an outstanding experience & in the end, the class of 2008 taught me a valuable lesson. THANK YOU! Pictures and full story below. At the Iroquois Prom, I ended my traffic safety program for the '08 school year with a Prom-Pledge to be safe & sober behind the wheel. Deanna Russo and I have been each pushing traffic safety (Deanna geared strictly towards drinking and driving) & I (traffic safety) were very excited with the way we ended prom season on such a positive note this year. As you all know, I have dedicated my entire year to a topic close to my heart, "Safe Driver Awareness." This year was full of speaking engagements and in conclusion to each one, I hoped that I will have made a difference in at least one of the lives that I come across. Making a difference in at least one life may change many as it truly is a trickle down effect. If I can change one students mind about actions behind the wheel, his/her driving values will eventually rub off on his circle of friends. Every speaking engagement is and has been a serious job & going to prom was the perfect ending and definitely put a FUN spin on it with the students. I was blessed to become a very close part of the Iroquois High School family this year. I made approx. 15 trips to Iroquois and had many LONG meetings on what we can do to promote traffic safety. One idea that I suggested to Trooper DePlato and 4 other School Resource Officers in a meeting at the Elma station was joining the students at the senior prom in reminder of being safe & sober behind the wheel. They were all for it and became very excited! So became the idea of signing prom pledges at the Iroquois Senior prom. Deanna and I ventured out in what seemed like a hurricane! We went to prom armed with Prom Pledges (photo below) Pens donated from the NYS Police with a reminder that drinking under 21 is illegal, Deanna had C.A.I.D brochures and the finishing touch was the 8x10 photo of her hugging her sister who's life was tragically ended by a drunk driver at the age of 18. The students knew the story of Deanna and her sister as Deanna has now spoke at Iroquois High School's pre-prom assembly the past 2 years. Therefore, that photo was an instant reminder. So many students stepped up and signed the promise. Deanna and I stayed a the prom-pledge table until dinner. We then ate a delicious meal, had an enormous piece of apple pie, then made our rounds to visit with the students. Eventually, Deanna twisted my arm to get out on the dance floor with the students. It was rather funny as I felt kind of old!!! The only thing that got me off the dance floor was the fact that I got to crown the prom queen, princess and their court. Then the emotional part set in. I had around 5 students approach me and ask why I did what I did for their school this year. They then told me that I was the coolest Mrs. NY that they have ever and will ever meet. They said that me being at their prom, me being serious about the pledges but then lowering my guard to get out on the dance floor to have fun with them was "awesome." They were like, wow, you are real person, how awesome....then they thanked me for all that I have done over the past few months for them!! Their prom song came on - it was ironic b/c that was MY prom song 11 years ago. As I looked around, I saw the students doing as I did. They were dancing to the song in circles of friends. My friends and I did the same thing!!! I looked around and realized it was the end of a chapter and the start of something new for them. Something that I experienced 11 years ago. At that moment, the students taught me something......I need to slow down.....really, slow it down. It was 11 years ago that I graduated and now I stand looking at them from the outside and wonder.......how did I ever grow up so fast? So, thank you Iroquois High School Class of 2008. You are an incredible group of students and I wish you nothing but the best of luck in all you do. You made a lasting impression on me and it will live with me in all I do. Erica was the 1st to step up and sign. She started something wonderful that night! Deanna & I at our table. Raises a question! With the ease that new technology has given us, why do others find it to difficult to actually take a photo? Look at the quality of it above! Deanna & I on the dance floor with "dumb & dumber."